Lorraine Paton: Alberta - Did you know Alberta has ferries?! Today, I'm talking about ferries. Now, if you are the least bit familiar with Alberta, you'll think you misread today's topic. Ferries? Alberta is landlocked, how can it have ferries? Even as a native Albertan, the idea of ferries seems odd. Alberta actually has seven ferries, which run from spring to fall, and I've been on one, The Bleriot Ferry. 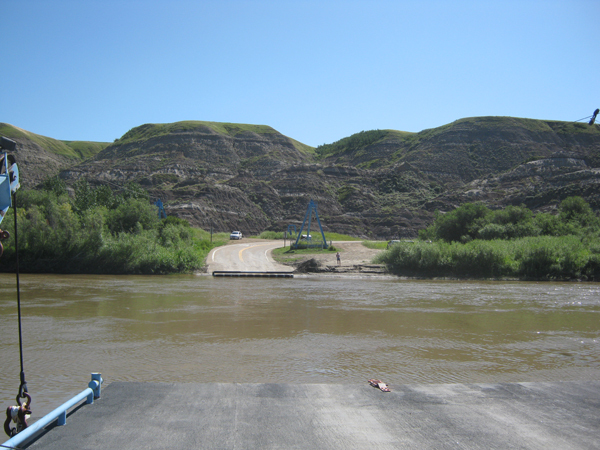 This ferry crosses the Red Deer River, which is about 105 metres (345 feet) at this location. I thoroughly enjoyed the trip across the river. It felt leisurely... seemingly emphasizing the fact that we were on holiday when we used it. In some ways I wish I had to use a ferry like this every day... just to know for those few minutes everything is going to slow and all you have to do is just enjoy the ride. When was the last time you took a ferry? I've been on a few ferries, and love them. It is like taking a mini-cruise!